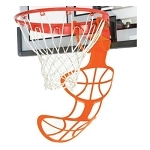 Lifetimes 44 inch Acrylic Fusion Basketball Backboard features a pro-glass look and provides superior performance. The steel frame gives added rigidity for improved rebound. The graphics are screen printed with ultraviolet protected inks offering fade resistant color. Features double compression springs that provide spring-back action. Slam-it is constructed of solid steel with 1/2 inch braces and welded steel hooks. 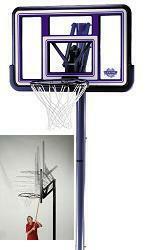 Use a broomstick to raise and lower the backboard. 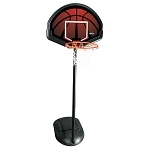 This adjustable basketball goal adjusts from 7.5 to 10 in six inch increments. Players of any age or skill can enjoy the game at their level. Lifetimes 3.5" Diameter pole is excellent for strong & solid goal support. 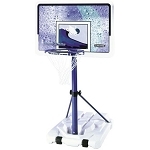 This Basketball Hoop With Pole is protected with a weather resistant coating. *Competitive Edge Products, Inc. is an authorized Lifetime reseller. 1993mustang_22 Beautiful product ~ Thanks so much ~ Super Fast shipment !!!!!!!! demandkimsmom Exactly as described. Good value. Thanks! jeanna1956 Excellent. The grand kids are having a great time with the new goal! voss10395 Fast Shipper. Item as described. Will buy from again. 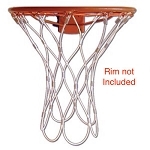 hoodlumsqd Great basketball hoop and supper FAST shipping! Thanks for the DEAL! ozzyandpepi Great item, speedy delivery. Buy with confidence A+ Seller!!! kkkarenj Great seller....excellent product ....A1 service! Great Price! Thanks!!! Dimensions: 46" x 33" x 6"